All Phenix Industry brake fittings and hoses are designed to DOT compliant specifications, but they are not DOT certified at this time and should only be used for off road racing applications by professional mechanics and teams involved in professional motorsports. Racing by it's nature is a hazardous profession and the user is responsible for determining the suitability of the product and assumes all responsibility for its use. The Phenix fuel filters are designed to be used in conjunction with each other. The primary filter should be placed between the tank and the pump and will collect all of the major debris before it has a chance to damage the pump. This filter is a 100 micron stainless steel cartridge type filter which can be easily cleaned and reused. The compact in line filter should be placed between the fuel pump and the carburetor or injector nozzles. This is a 40 micron stainless mesh screen type filter which should be cleaned on a regular basis. Phenix Hose products have been tested through independent ASTM laboratories to meet all SAE-30R7 standards. Our stainless braided hose products were designed for easier assembly by the end user, plus limited wire frays and spreads which occur after cutting. Our hoses are engineered to be dimensionally consistent and easier to assemble with re-usable fittings. The enhanced curing process of the hose uniformly applies the glue and adhesion of the glue between the stainless braid and the CPE inner core. This dramatically reduces the frays and spreads associated with cut stainless braided hose products. Operating temperatures are from -40 degrees to +35- degrees F and deliver hydrocarbon and alcohol based fuels, motor oils and coolant. Phenix Compression Swivel Hose Ends are constructed from lightweight 6061 aluminum and designed for smooth flow, easy assembly, and longer life. All elbow ends are built from one-piece billet tube construction, avoiding leakable braze joints. Viton O-Ring seal allows 360 degree rotation. 37 degree AN flare assures leak proof sealing surface eliminating the need for taping. Compatible with all AN adapter fittings. Made in USA. Welcome to the next generation in race plumbing and safety. 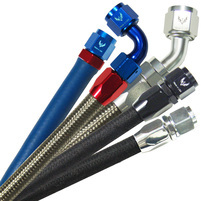 Speedlox® locks and seals your 37 degree hose end to the fitting with only hand tightening. No more worry of inadvertent "back off" creating leaks at the connection. The Speedlox® patented dual-locking system, locks both the hose end and the locking sleeve to the main fitting body. Thermal cycling combined with the inherent vibration of a machine during operation creates this costly condition. With the patented pending Teflon sealing system, leaks or weeping at the hose end or fitting connections are a thing of the past. The most unique features of the Speedlox is that you only have to hand tighten the connection to seal it, then push the locking sleeve forward to lock it. Speedlox® will never cross-thread with the patented "B" nut guide. U.S. Patent # 5882044 Patent Pending.